Hamilton re-used a lot of model names in the 1950's that were first used 20 or so years earlier - which in hindsight doesn't seem like a long time but I guess in watch-years that's long enough for past models to be forgotten. Usually there's nothing in common between the models, other than the name. In fact, some names were used multiple times with only a few years separating them. Take for example the 1955 Russell. It was produced for three years. 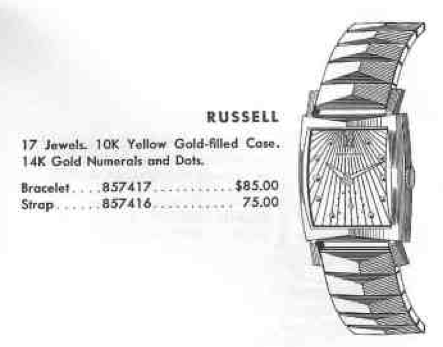 The original Russell was introduced in 1940 and had flexible lugs. Other than being 10K gold filled, the two models are completely different. The 1955 Russell has a lot going on with it. The case has a number of angled features and the sterling silver dial with solid gold numerals and dots has radiating grooves that originate at the 12. It's really a pretty cool looking design, in my opinion. Behind the dial you will find an 8/0 sized, 17 jewel, American-made 730 movement. The 730 is a shock-jeweled replacement for the 747 and was introduced in 1955. I recently picked up a Russell and until I had it in my hands I didn't realize that the dial had grooves. I thought is was just a plain white dial. Like most project watches I purchase, this one was very dirty and needed some attention - but that's the way I like to find them. With the crystal out of the way, the details of the dial are much more apparent. It's rather dirty too - I'm hopeful that it will clean up. The 730 is a great movement. It's probably one of the easiest movements to take apart and put back together. Other than the shock jewels to protect the balance staff, it's identical to the 747. While everything is being cleaned I'll replace the crystal with a new acrylic version. I normally use glass but the price was right for this crystal. Glass is harder to scratch but once it does, the scratches are permanent. Acrylic is easier to scratch but it can usually be polished back to scratch-free. So deciding which one to use is really a personal preference. A thorough cleaning restored the movement to good running condition. A little tweaking to the regulator was all that was needed to bring the beat rate in line. And here's the finished product, paired with a new lizard strap. The original dial didn't get perfectly clean. I'd say it's a 50:50 mix of original luster and mild patina. I wouldn't want to clean it any further though as that would risk losing the printing. I don't know how well a grooved dial like this would respond to being refinished. It's certainly not bad enough to refinish at this point. In fact, I think it turned out rather well.